DigBoston—and this should be obvious, but it bears stating plainly—is against the US or any nation, organization, or individual having nuclear weapons. Because the longer anyone has them, the more likely it is that they will be used. And if one is used, there is a very significant chance that many or even all of the nukes will be used. Lest we forget that when the US had the first two atomic bombs in existence, and used one, it was very quick to use the second. That’s why last week, the Bulletin of the Atomic Scientists, a journal founded in 1945 by Manhattan Project scientists who “could not remain aloof to the consequences of their work,” moved the hands of its famed “Doomsday Clock” up from “two and a half minutes to midnight” to “two minutes to midnight.” The clock has not been so close to “midnight”—meaning nuclear war—since 1953. Shortly after both the US and the former Soviet Union tested their first outrageously destructive hydrogen bombs at the height of the Cold War. The journal’s reasons for taking this alarming step are many, and can be read on its website, thebulletin.org. But at base, it is dangerous changes to US nuclear policy under Presidents Barack Obama and Donald Trump that threaten to overturn treaties that have led to decades of reductions to the global stockpile of nuclear warheads—from over 65,000 in 1986 to about 15,000 today—coupled with Trump’s escalating war of words with North Korea’s Kim Jong Un that led to the clock being dialed forward. Behind the bluster is the world’s largest military: America’s. Which for the last few months has been positioning conventional and nuclear forces within easy striking distance of North Korea. So when, according to the Wall Street Journal, some of the less sane Trump administration figures like National Security Advisor H.R. McMaster support the idea of giving the growing North Korean nuclear weapons program “a bloody nose” with a military strike using “small,” “tactical” nuclear weapons, the world takes notice. And the Doomsday Clock continues its unnerving march toward midnight. Lest readers think such concern is overstated, Business Insider just reported that the US has deployed B-2 stealth bombers to Guam—joining B-52 bombers already stationed there. Both planes are capable of delivering nuclear weapons. Including the new B61-12 gravity bombs that, while not slated to be deployed until 2019, are supposedly able to take out deep bunkers with a minimum of damage and fallout. Which, together with their adjustable yield setting down to a fraction of the Hiroshima bomb, makes them more likely to be used, according to peace activists and defense officials alike. And a fraction of a bomb that destroyed and irradiated an entire city is still much more dangerous than the largest US conventional weapons. Not to mention the Pandora’s box problem. Since once the US opens that figurative box by using nukes in battle, there’s nothing to stop other countries from doing the same. Least of all North Korea. Russia and China have been frantically trying to get the US to pursue a diplomatic path to peace with North Korea, but to no avail. 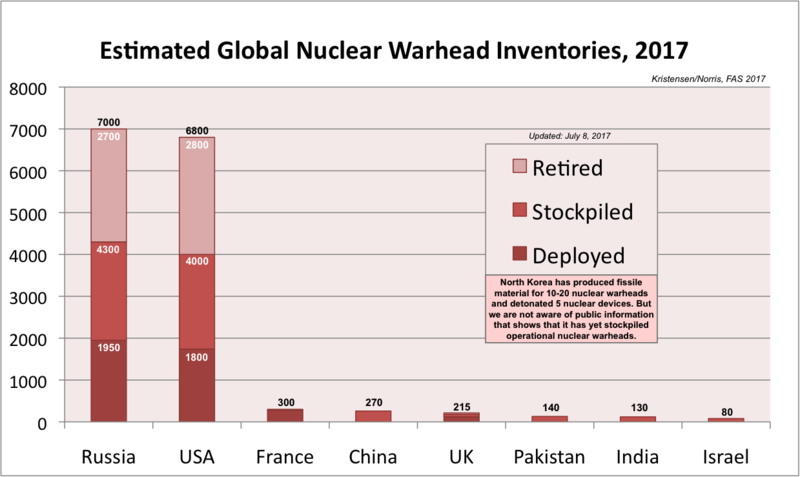 At a time when the US no longer has any nuclear disarmament negotiations in progress with Russia, a nation with 7,000 nuclear warheads—the most of any nation—and tensions are rising with China, which has 270 warheads, that is most disturbing news indeed. Because the path from the “bloody nose” of a few “smaller” nukes like the B61-12 dropped on North Korean nuclear weapons sites—or sites that Pentagon planners assume are nuclear weapons sites despite having been wrong before due to poor intelligence on North Korea—to a global conflagration is crystal clear. Since the ironically named “Demilitarized Zone” between North and South Korea is the most heavily fortified place in the world. And 35 miles south of the zone is Seoul, the capital of South Korea. If the US nukes North Korea, then Kim Jong Un would have every reason to nuke American targets that North Korean missiles are probably capable of reaching in the Pacific basin—and even Seoul itself in retaliation. Followed by other nuclear strikes, using precisely the same “use ’em or lose ’em” strategy that the US has followed since the dawn of the Atomic Age, according to Daniel Ellsberg—who recently released a book about his decade as a senior American nuclear strategist prior to his leaking the Pentagon Papers and helping end the Vietnam War. Once nukes are flying, therefore, there’s nowhere to go but down. North Korea has somewhere between 10 and 60 warheads—depending on whether you believe the lower estimates by peace groups like the Nobel Prize-winning International Campaign to Abolish Nuclear Weapons or the higher estimates by US government sources—and its quest to figure out how to miniaturize nukes to fit on its short-, medium-, and now long-range missiles has been a precipitating factor in the current crisis. The US, for its part, has about 6,800 warheads overall. About 1,800 of which are deployed, according to 2017 data from the Federation of American Scientists. The American military would be dropping nukes on direct orders from a president with all the powers of his predecessors to use them at will with no check from any other branch of government. The weapons would strike a very small country that shares borders with Russia and China—two rival superpowers with huge armies and thousands more nuclear weapons between them. A couple of miscalculations involving unexpected fallout yield or an errant strike due to a jammed guidance system or any number of other unforeseen occurrences with incredibly dangerous nukes and it’s bye-bye Vladivostok and adieu Yanbian. An unauthorized US flyover of Russia or China or the entry of a US fleet to their territorial waters during attacks on North Korea could also result in a nuclear response from either country—especially should the US lower the bar and start using nukes in combat again. And North Korea, with nuclear weapons that are hardly the most accurate or stable, could easily make mistakes that would draw Russia or China into a shooting war. Even though North Korea has stated that it is “only” targeting the US with nukes, according to Newsweek. The possibilities for error are endless in a conventional war, let alone one involving nuclear exchanges. So it’s easy to see how any use of horrific weapons of mass destruction can quickly put the entire world on the fast track to Armageddon. For these reasons, and many more besides, DigBoston cannot stand on the sidelines and remain silent while the threat of a war that would exterminate the human race rises by the day. To do so would be an abrogation of our moral and ethical responsibilities—not only as journalists, but as human beings. And if the planet is destroyed, journalists like us aren’t going to be able to report the news anymore, now are we? Nor will our audience have any use for it in the hereafter. As such, this publication is joining the swiftly reviving movement to abolish nuclear weapons. Open our pages wide to opinion articles calling for the abolition of nuclear weapons, as we continue to editorialize about same. Produce an ongoing series of columns, features, and investigative reports in the public interest exposing Massachusetts institutions involved in developing, producing, and/or profiting from nuclear weapons. Work directly on campaigns to abolish nuclear weapons with local, national, and international peace organizations—adding the name of our publication to the growing list of civic, social, religious, professional, and business organizations in tandem with the 56 nations that have already signed the new UN Treaty on the Prohibition of Nuclear Weapons in saying that the only sane nuclear weapons policy is to mandate a world without such weapons. Help organize our colleagues in the news industry to join us in the fight to abolish nuclear weapons. We’ll talk about more specifics over the coming months, but anyone with questions about our stance is welcome to email us at editorial@digboston.com. Jason Pramas is executive editor and associate publisher of DigBoston. At this point, anyone who pays attention to current affairs in even a cursory manner will be aware that President Donald Trump’s proposal for the next federal budget is a savage attack on working families — and a slap across the collective face of the working people who voted for him. Appropriations for Medicaid, the Affordable Care Act (“Obamacare”), the Children’s Health Insurance Program, Social Security Disability Insurance, Supplemental Nutrition Assistance Program, Meals on Wheels, the National Institutes of Health, the National Science Foundation, the Environmental Protection Agency, the Centers for Disease Control and Prevention, and the Public Service (student) Loan Forgiveness program are to be slashed — with funding for programs like Child Care Access Means Parents in School, the Legal Services Corporation, the Corporation for Public Broadcasting, and the National Endowment for the Arts to be wiped out entirely. But fear not because Trump offsets domestic immiseration with major increases to the military and law enforcement budgets. Which translates to more dead peasants globally, more dead immigrants at our borders, and more dead black kids at home. Making America great. According to the administration anyway. No real surprise to anyone who was paying attention to the company Trump was keeping (defense contractors and theocrats and charter school flacks, oh my) during his campaign. Even as he mouthed populist rhetoric that convinced enough white working and middle class voters in swing states to back him that his victory in the Electoral College was assured. So what’s the alternative? At the moment, the People’s Budget: A Roadmap for the Resistance FY 2018 proposed by the Congressional Progressive Caucus does a reasonable job of pointing to a more positive future for the nation. It hasn’t gotten much coverage, unsurprisingly, but it’s definitely worth a look. Bullet points from the CPC website follow. Massachusetts Reps. Jim McGovern (D), Mike Capuano (D), and Katherine Clark (D) have all sponsored the forward-thinking budget. Plus a raft of left-leaning Democratic groups and organizations to their left are supporting it. The proposal is obviously a long shot, but you can’t have a successful movement for change without some aspirational campaigns like this one. For more information, and to plug into local activism for the passage of the People’s Budget, check out mass-peoples-budget.org. Readers seeing this column online on Tuesday 5.30.17 can take immediate action at the March Against President Trump’s Budget Plan, tomorrow (Wednesday) at 11:30 am at the Tip O’Neill Federal Building on Causeway Street in Boston. 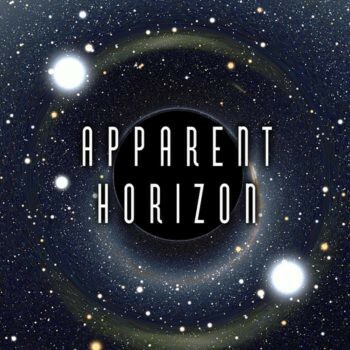 Apparent Horizon is syndicated by the Boston Institute for Nonprofit Journalism. Jason Pramas is BINJ’s network director and senior editor of DigBoston. Copyright 2017 Jason Pramas. Licensed for use by the Boston Institute for Nonprofit Journalism and media outlets in its network. Over the long four months since the election of President Donald Trump, this column has focused more on national politics than usual — with special attention to the promising wave of broadly progressive grassroots activism that has resulted. However, it’s important that our newly restive populace also keep related developments on the state political scene on their radar. So, here’s the first installment of an occasional “Action Call” series to review hot-button issues in Bay State politics, and to point readers toward forward-thinking advocacy groups they can join to take action in the public interest. This time out, a look at the public transportation crisis. We may have just dodged a bullet with Gov. Charlie Baker backing off a plan to cut weekend commuter rail service for a year to ostensibly save $10 million while making upgrades to the rail lines — which would doubtless have been disastrous for the regional economy. But the MBTA — and 15 regional transit authorities across the Bay State — have been in serious trouble for some time. Though not for the reasons most news media focus on. The origin of the present dilemma goes back to 2000, when the state eliminated the T’s “backward funding” system where any costs it could not cover with fares and other income were simply paid by state government, and replaced it with a “forward funding” system where the T received an annual outlay at the start of each fiscal year based on a fixed percentage of the state sales tax. Later, the budgets of the other regional transit authorities were “reformed” along similar lines. Making the deal worse for populous eastern Massachusetts, debt that should be part of the state budget was loaded onto the T in “exchange” for getting the cut of sales tax revenue. Then those revenues failed to meet projected targets, leading to more debt. All of which caused the rising fares, worsening service, and diminishing investment in physical plant and rolling stock that riders have been made to suffer through — even as T ridership grew 15 percent between 2004 and 2014. The solution to this problem is to return to funding the T and the regional transit authorities as the public services they are, and to stop pretending that they’re businesses — or that eliminating good union transit jobs and slashing desperately needed services with various privatization schemes will do anything more than line the pockets of favored consultants and contractors. Such a move will require tax increases on corporations and the rich that they will fight tooth and nail to stop. And that’s why large numbers of people will have to take to the streets to make it possible. Readers interested in taking action to defend and expand public transportation statewide should check out the big new labor-community activist coalition, Invest Now Mass. Its member organizations range from T workers unions to public transit advocacy groups to civic associations. According to Invest Now lead organizer John Doherty, the coalition plans to pursue organizing in five areas: investment, equity, economic development, climate, and transparency. Plug in at its website: investnowma.org. Anyone interested in having an Invest Now organizer give a public talk in their city or town can click the “Host a Speaker” link in the “Take Action” section of the website or contact Doherty directly at 617–592–2230. We felt ambivalent about the phone call and Trump’s recent remarks. On the one hand, the call brought a chance for the world to reconsider its relations with a democratic island nation—Taiwan. On the other hand, we are puzzled by the reaction of the so-called liberals and the news media. Because the last thing that we think liberals should care about is “angering China.” However, many choose to put all their focus on that. Liberals should care more about the people of Taiwan and how such allies—sharing so many similar values with the people of the United States as we do—should be treated going forward. Although we can hardly accept that Trump uses Taiwan as a bargaining chip with China, we also have to point out that the current China policy of Obama’s administration has brought many crises to Taiwan. For example, in 2009, when Obama met with the Chinese president Hu Jing-Tao, he continued encouraging the Cross-Strait Agreement and dialogues that encouraged the former Kuomintang (KMT) government—which presided over a military dictatorship from 1949 to 1987—to pursue policies detrimental to Taiwan’s democracy and sovereignty in order to accelerate integration with China both politically and economically. Eventually triggering the Sunflower Movement in 2014. If people worry about Trump’s move of using Taiwan as a business bargaining chip, they also have to be aware that the Democrats and many liberals of all stripes were/are also using Taiwan as a bargaining chip to maintain America’s relationship with China. If Americans really care about Taiwan’s situation and the difficulties it is facing—being treated as a pawn in a giant geopolitical game— the best way to help is to “Urge the Normalization of US-Taiwan Relations.” Normalized relations can be the best way to keep rumors at bay and—along with allowing democracy-monitoring civil society organizations to act as watchdogs in the public interest—avoid letting the Taiwan issue be manipulated by a small number of politicians, from the president on down. Trump’s victory can be seen as part of the recent trend of the rise of right-wing conservatism around the world. However, when conservative forces are gathering, progressives worldwide must gather together as well. There is no reason for liberals and progressives to abandon a democratic and liberal ally, or leave them alone to face relentless political economic pressure and the growing threat of invasion from authoritarian China.